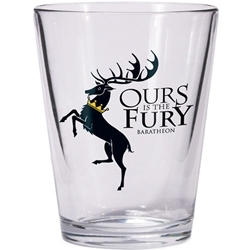 When you take a shot from this Game of Thrones Baratheon Shot Glass, emblazoned with the house sigil and "Ours is the Fury” motto, your thirst will be quenched. Permanently! House Baratheon of Storm's End is one of the Great Houses of Westeros, and is the principal house in the Stormlands. Holds 2 ounces. Officially licensed by HBO.